I’m Victoria lynn Weston and here’s your AYRIAL Newsflash for the week of October 2nd, 2017. With autumn upon us, we can expect shorter days and pumpkin-spiced everything. This week’s Cosmic Forecast by bestselling author and renowned astrologer Constance Stellas: The big astro news is FULL MOON on Thursday. She is in action oriented and sometime belligerent ARIES. Choose your battles! Or you could just howl. Believe it or not, corporate executives have been using intuition – or extra sensory perception – in the boardroom for decades. I’ve helped Fortune 100 company bosses improve their insights, and I’ve learned that the best bosses are the ones who trust their intuition. If you want to learn more, check our my article – BOSSES WHO TRUST THEIR INTUTION on AYRIAL.COM. If you love movie themes about love, inspiration and spirituality, I predict you’ll love the film, THE STRAY starring Sarah Lancaster, she used to be the star of “Saved by the Bell: The New Class”. Sarah was an absolute delight to talk with her about this film. THE STRAY tells the true story of Mitch Davis and a stray dog named Pluto, who saves the life (literally) of his struggling family. Pluto comes out of nowhere and quickly makes himself at home with the Davis family, who are on the brink of falling apart. This wonder dog manages to save a lost toddler, bring comfort and companionship to a hurting 9-year-old boy (Connor Corum; Heaven is for Real), help restore a marriage, and repair a broken father-son relationship. And there is more: On a backpacking trip, lightening struck, and had not Pluto been near dad Mitch Davis to take the brunt of the electricity, Mitch would have died. Like never before, THE STRAY will have audiences appreciating the true emotional bond between of dog and humans. Check out my interview on AYRIAL TalkTime and click to learn more about THE STRAY. This month, AYRIAL welcomes our newest member, Elaine Cheung, founder of Health Solutions. Ms. Cheung takes a unique approach to helping her clients. By using a variety of healing methods, as well as incorporating her intuitive transformational healing skills, she helps clients change their limiting beliefs and emotions by addressing the physical, mental, and spiritual aspects of the soul. Each session with Elaine Cheung is intuitively guided and specifically tailored to the individual. Her clients include business owners, couples, those in addiction recovery, suffering from PTSD, childhood traumas, depression, anxiety, or those who simply feel stuck in their lives. She consults by telephone, in-person, or via SKYPE. Click to learn more about Elaine Cheung AYRIAL.com. 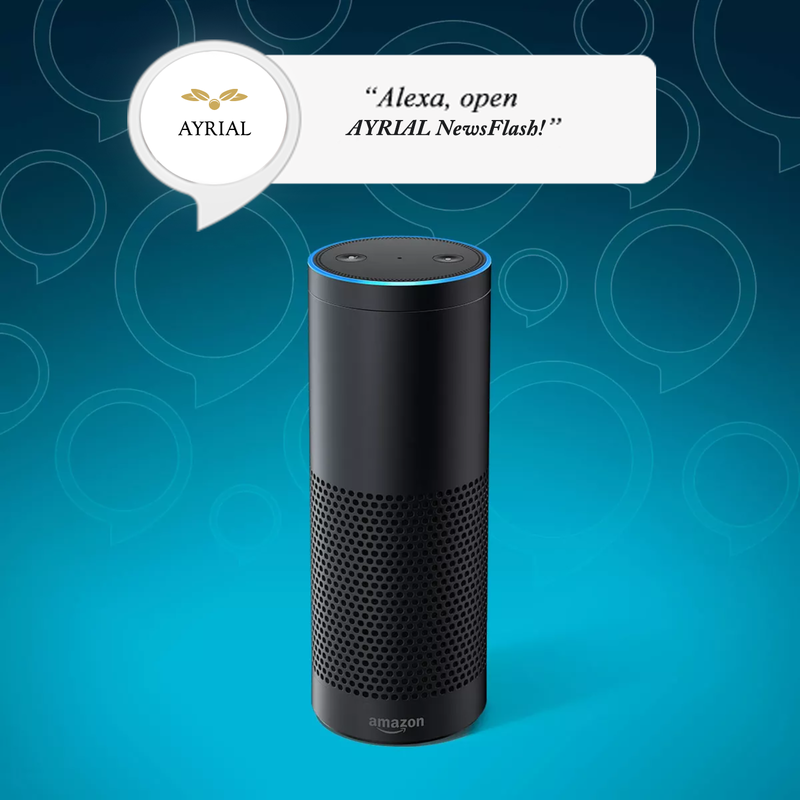 If you are an entrepreneur, business owner or lifestyle consultant who’s interested in marketing to half a billion users of Amazon Echo and Microsoft Cortana devices to promote your products, Studio Carlton is here to help. In August, Microsoft and Amazon announced an initiative that will soon merge the search functions of both delivery systems. That means your skill set, newsflash, custom Alexa Skill or podcast produced by Studio Carlton will be available to the 510 MILLION Windows 10 and Amazon Echo device users. The Studio Carlton team includes film, television, online, and technology veterans who can create the right package for you at a price you’ll love. Check out Studio Carlton and click to email to schedule a free consultation today. Our AYRIAL TalkTime featured podcast for this week is just in time for Halloween and the upcoming holidays, where we’re constantly tempted by sweets. Now, we all love chocolate, but for some of us it can become an actual addiction. Dr. Glenn Livingston, author of STOP EATING CHOCOLATE BEFORE IT KILLS YOU joins me to discuss his own addiction to chocolate, how it affected his life and his health, and about how you can free yourself from binge eating forever. And that’s it for this week. 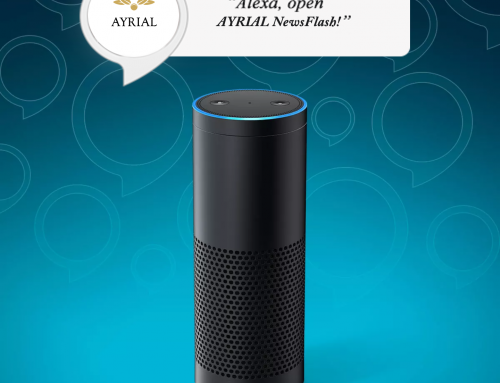 For more body, mind, and lifestyle tips, visit AYRIAL.com – that’s A.Y.R.I.A.L. dot com. Featured Podcast: Guest Dr. Glenn Livingston – STOP EATING CHOCOLATE BEFORE IT KILLS YOU!